A few weeks ago I asked for your design dilemmas or future project inquiries and today I am here with our first mood board. Jennifer is wanting to remodel her kitchen. She loves and is inspired by their country farm life. She wanted something that would easily transition to their house. Here is the mood-board I have created for her farmhouse inspired kitchen. I would start out with a light and classic wide plank hardwood floor. I love this Jasper Hardwood found at build direct Jasper Hardwood – European Brushed Oak Collection. For the walls, something clean and airy. Who doesn’t love the shiplap look to any farmhouse design, but if your budget doesn’t allow for that, a bright white wall paint would look just as lovely. Jenn would love to redo all of her cabinets, but budget may not allow for that. 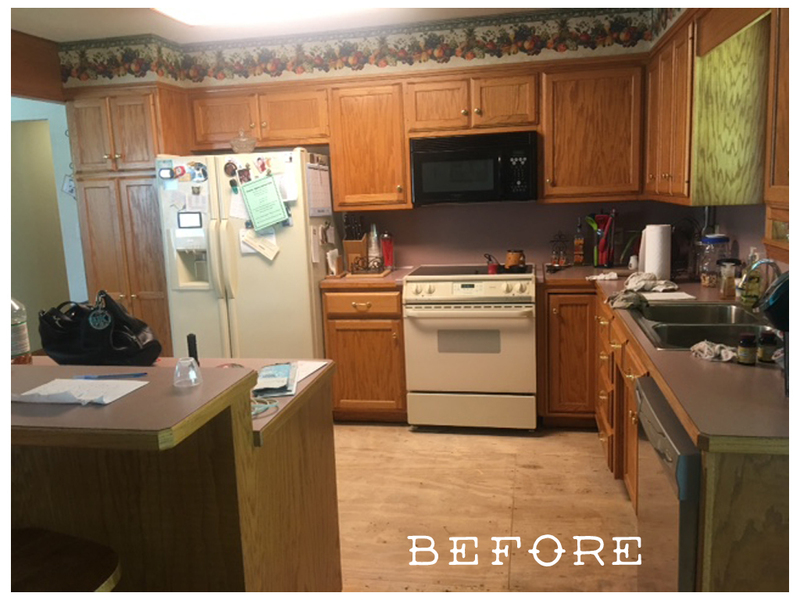 I suggest that she paint her current cabinets a beautiful light gray, update the hardware and we focus on a new large white island. Sticking with a good country farmhouse theme, I think we should go with a beautiful dark butcher block counter top. 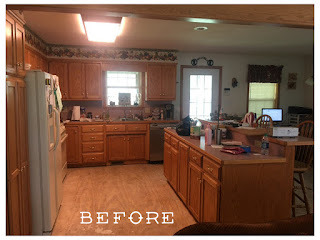 Since everything is so nice and airy, the dark rich hue of the wood on the countertops would really pop. Over the island, she really needs a statement pendant or two. This Chicken Wire Basket Pendant Light is just the icing on the island cake, or the cherry on the island sundae…now I’m getting hungry. To the right of the kitchen area, I would like to incorporate a round farm table, breaking from the tradition of the large rectangular tables. The white base and the dark wood top would complement the island and the natural colors of the kitchen. This classic old farmhouse chair would be perfect with her round table. The touch of green would be a beautiful color to complement her farmhouse kitchen. Above the table, I think she could hang this beautiful White Washed Wood Sphere Chandelier. The color is in line with the light flooring giving the whole room a balance. Lastly, she can add some detailed farmhouse staple pieces to finish it off. White porcelain dishes, a Bessie cow head,and a large magnolia wreath. You know, the great thing about a classic farmhouse design is the DIY possibilities that won’t break the bank. Many of these beautiful pieces could be quick weekend projects found at any local thrift store or flea market. This whole style is just classic and simple. Do you have a dilemma of your own? Or need inspiration? Let me know what you are wanting and I can whip you up your own mood board. Post contains some affiliated links.